How do you make the projection of molten lava spewing in the air raining down from a cloud ash more terrifying? 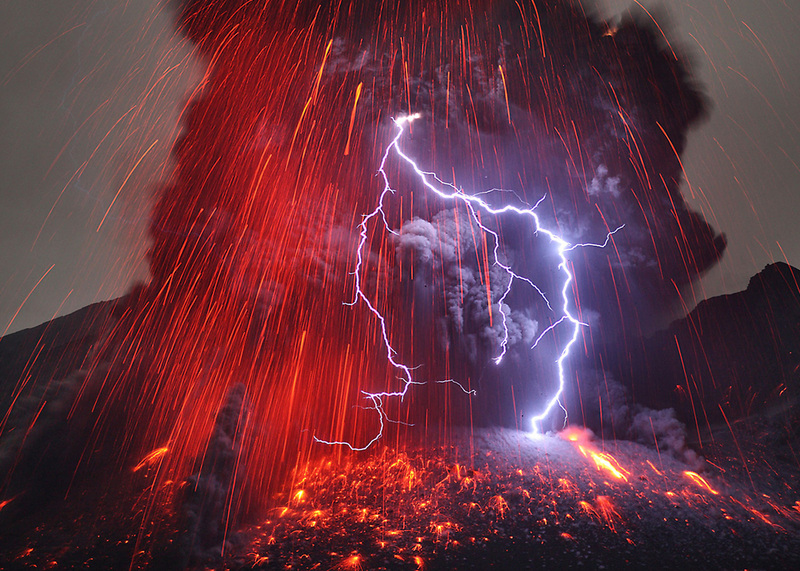 Add erupting bolts of lightning bellowing down creating a mix of electrical burning frenzy. 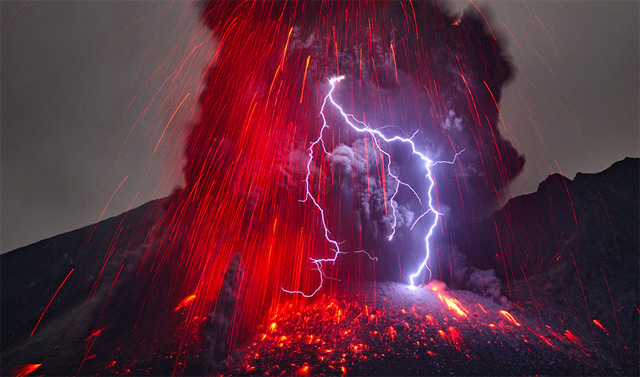 The occurrence of the phenomena is unclear, but Martin Rietze on a trip to Sakurajima Valcano in southern Kyushu captured these beautiful-terrors with wonderful precision and bravado. Martin is no stranger to danger which becomes obvious when viewing is vast body of work ‘ALPE’ (Alien Landscapes on Planet Earth) — a collection showing some of the natural worlds beauty in it’s oddities. Those used to dealing with flash know the common 1/250 shutter speed — a common max sync speed for flash units. The Profoto Pro-b4 1000 Air takes this common sync speed and laughs in it’s face. With a recycling time of 30 frames per second and flash duration of 1/25,000 of a second, this $7900 portable battery pack by Profoto can be remotely triggered (via the built-in Profoto Air radio sync receiver) to capture almost any moving subject in a frozen, gravity defying moment. The battery has an 11-stop power range, holds a charge of 220 full power flashes and completely recharges in a mere 45 minutes. Demonstrating the strobes, Profoto shows why this battery pack is an action photographers dream. 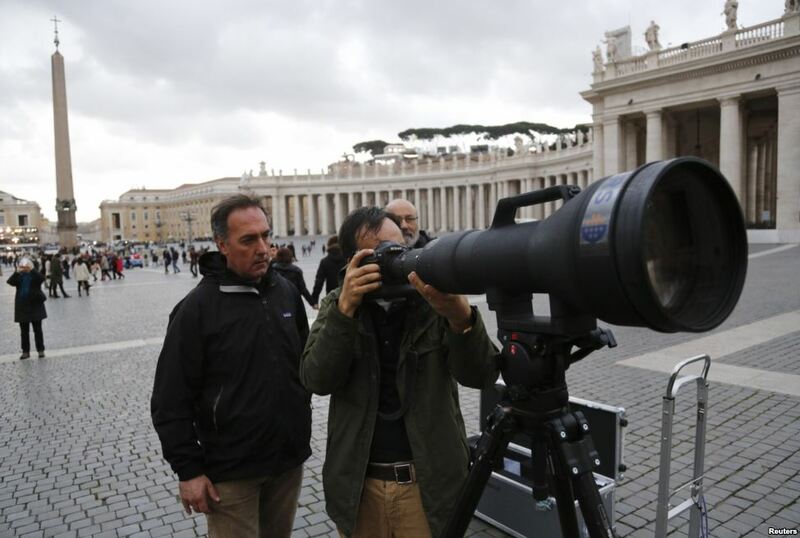 The newly appointed Pope wasn’t the only spectacle to make an appearance for the annunciation; Nikons behemoth AI Zoom-Nikkor 1200-1700mm f/5.6-8P IF-ED lens descended upon St. Peter’s to capture the event up-close — from afar. Italian media La Stampa released pictures of photographer Dylan Martinez behind their holy grail of long lenses which was showcased earlier this year at CP+ Show 2013. How far can 1700mm get you? Nikon’s product info page shows you just how far away this lens can deliver. Nikon’s D800 was a record setting masterpiece — one of few cameras that we’ve seen in such high demand. With a body so popular, DxOMark recently released a comparison of different lens groups (50mm, 85mm, Macro, and standard zoom) showing the best lens/body combos according to their measuring methods. Their breakdowns include the price, DxOMark Score, and a short review of the top three for each lens class. Do note that not every available lens within the class was tested, rather a handful of top contenders. The ever popular 70-200mm is also lacking from the review, but then again it doesn’t meet any of the lens classes tested. Regardless, if you’re in the market for a new lens and own a D800, it’s always good to do a little research! With a world continually evolving to be more digital Adobe has decided to drop the axe on their own physical media production by eliminating and no longer offering boxed versions of their popular software. With technology producers no longer including optical drives on computers and fast internet speeds becoming common, users will now have to either digitally download or subscribe to use their products and services.